By Community Chickens on September 29, 2012 Visit Community's Website. I opened the garden gate the other day with a little tinge of sadness. I wasn’t going in to pick a delicious fruit or vegetable, but instead, rallied the chickens toward the door. 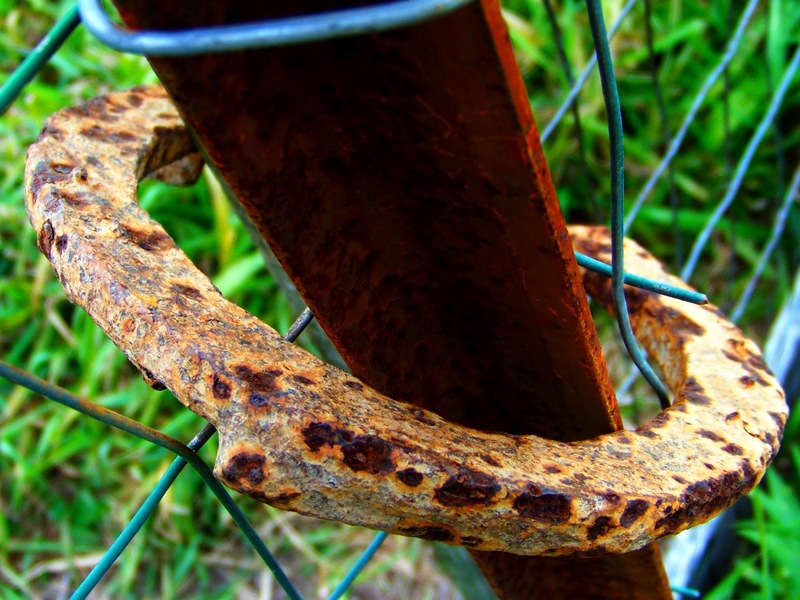 The rusty horseshoe that we found while plowing has kept the gate closed to the chickens and other prairie creatures. For the first time, the chickens were allowed into an area of our property where they’ve never been. 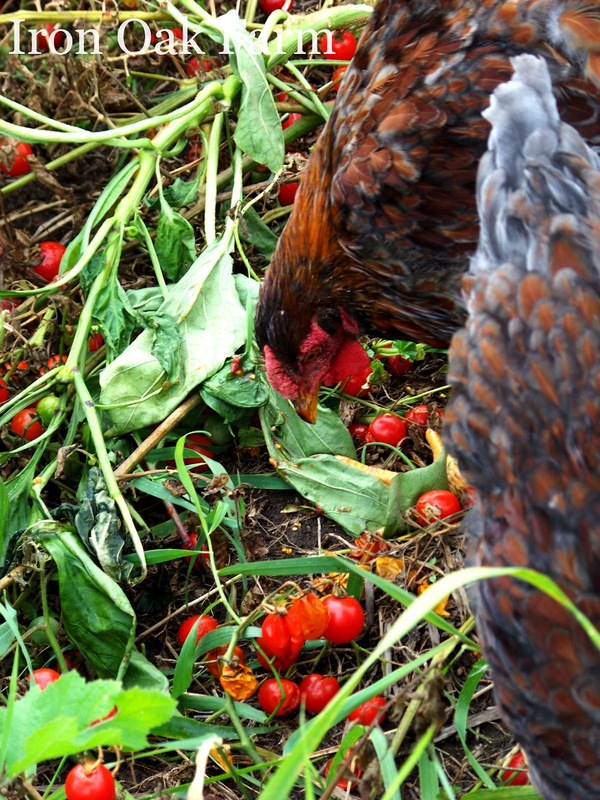 Each day they enjoy rooting through the soft, moldy tomatoes that didn’t make the basket, and bits of peppers and rotted squash that lay on the ground. They enjoy the open, soft dirt that the garden beds offer for scratching, and their droppings fertilize the soil for next year as they strut around. They are helping us put the garden to bed. We’ve had several frosts already here in Michigan, and the garden seemed to wither overnight, leaving the large orange pumpkins as the only things left to bring up. The brown sunflowers stand like solemn soldiers mourning the end of summer, their large round heads hanging down in sadness as earth tilts toward winter. I’ve never felt this way about fall. Fall is usually my favorite season. I hate summer. I hate the heat, the humidity and the stickiness. We didn’t have air conditioning at our last home and I could never get a good night’s sleep. I would lay miserably in bed with a noisy oscillating fan on my desk. We used to live in the woods, and summer in the woods is hot and humid under the canopy of the trees. There’s little breeze that can make it through the dense foliage. The mosquitoes were horrid, and while green is my favorite color, its monotonous sweep across the landscape was sometimes overwhelming and could close in on you. Summer was obnoxious, and I was always glad for it to be over. But autumn in the woods is breathtaking. We had a wall of large windows across the back of our family room and the brilliance of color would illuminate everything with a warm golden glow. I welcomed the cool days and the even cooler nights. Cozying up by the fireplace, the sweet musty smell of brown leaves, the fluffy down comforters to cuddle under and clingy tank tops traded in for warm soft flannels and cable knit sweaters. We will be in our new home a year this coming October, a full year of farming. We had the goats and chickens in the old house, but this new phase in our lives has moved us to the next level. It’s no longer just pet goats and some chickens, we’re now creating complete meals and truly living off the fruits of our labors. We’ve accomplished a lot in the short time we’ve been here. We moved a barn 40 miles, moved goats and rabbits and moved 40 chickens. We hatched baby chicks, raised turkeys from poult to (almost) table ready. Birthed Angora goats, started milking our dairy goat, and set up a cheese cave for our homemade hard cheeses. We set up a bee hive. We planted, cared for and harvested a large garden, a pumpkin patch and a cornfield. We built goat pens, turkey pens, canned, pickled and froze enough vegetables to fill an upright freezer to the brim. We learned to plow, disk, rake and plant with a planter. I learned to thread a baler and felt the stinging road-rash on the tender parts of my under arm that only 300 bales of hay can leave. My hair turned blond, and my Irish skin was more tan then it’s ever been, even with sunscreen! And as much work as it all was, for the first time in my life … I get summer. I’m sad to see it end. The harvest came in quicker than I expected. Esther’s milk has weaned off slightly, and the eggs have really slowed down between the fall molt and the shorter days. I’ve grown fond of the turkeys and am not looking forward to processing them. And now that I’ve tasted all that summer has to offer, I’ll miss it. I’ll miss the juicy sweet heirloom tomatoes right from the vine. I’ll miss the fresh crunchy cucumbers, and the sweet watermelons, cantaloupe and muskmelon, the fried zucchini and the tender lettuce. I’ve been taking a lot of photos lately in a fleeting attempt to savor the changing landscape. The drying cornstalks, the sand hill cranes before they migrate … it’s an attempt to “store” what won’t fit in a canning jar. 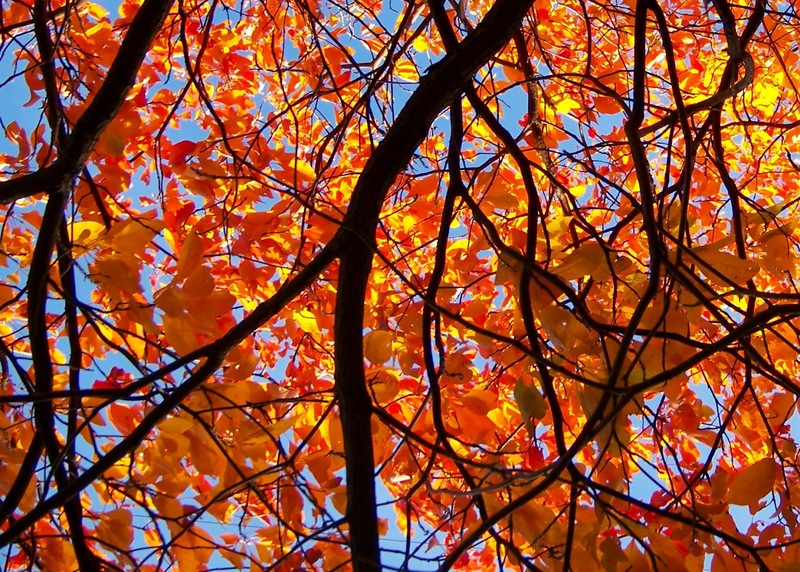 And as the green fades from the fields, autumn’s beauty ends summer with a brilliant bang of a finale. But the beautiful thing about life is that it repeats itself. Sure we grow older, but each year we get another chance to do it all over again. I’m a firm believer that every season has a purpose. The coming winter months will serve as a good excuse for me to stay indoors and start dying the mohair harvest. I’ll get my spinning wheel going, and work on sewing projects, knitting, weaving baskets, making soap, candles and drawing. It’s reassuring that spring will start it all over again. 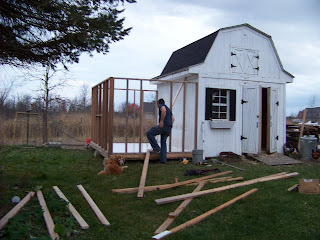 Next year should be easier as we now have structural things in place, like a working chicken coop and turkey pen, a garden fence and two tractors. Next year I hope to focus on improvement. To tighten up the things we threw together in haste. But for now, I will miss you summer, and I’m sorry for the grumbling I used to send your way. While I was bearing your stifling heat, I know now that you were warming someone’s tomatoes into juicy redness, and that you had a beauty all to your own, it was simply hiding in the trees. Come visit us at Iron Oak Farm. Your words are always written so well, but this post truly sank in heart. And congrats on year 1 of your farm! Jennifer, what a lovely post. I live in the Northwest now but spent many years in the South so I know what you’re talking about when you speak of hot and oppressive summers. I have a small “farm” with a few chickens and bees recently acquired last spring. I love it. I am envious of your goats though. . . angora and cheese. I will be watching to see how you’re doing. Maybe some day . . . .
Nana Bob, thank you so very much! And yes, you guessed just right with the hoses. 🙂 If you leave them out over winter without draining them they’ll freeze and crack and then they’ll leak. Ideally we’d like to run water out to the barn but the pipes have to be buried under the freeze line. We’ll get there someday! Your post is beautifully written and I really enjoyed the pictures. Your image of the sunflower was awesome! You should write a book. I would love to read it! But I do have a question. Why do you use buckets for water and roll up the hoses? I am sad to say, I just don’t know the answer. I think it might have something to do with frozen hoses, but not sure. I love your blog! Thanks for sharing everything. Jennifer, what a lovely, evocative end to summer! Thank you! Aw thanks! Good luck to you, I wish you well in all your endeavors! wow, spectacular post. so inspiring, as we hope to do many things you’re currently doing, starting next spring when we get our Nigerian dwarf goats and our chickens. All the best to you and yours!